Recorded in the spellings of Hackworth, Hakeworth, and Hackworthy, this is a surname of Old English pre 7th century origins. The name is believed to translate as 'Haca's homestead' and is historically closely associated with the county of Northumberland in the 19th century through engineer Timothy Hackworth. However the name itself almost certainly originates from somewhere else, although where is a puzzle. 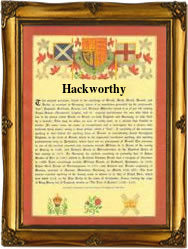 There is no place such as Hackworth shown in any of the gazetters of England in any near spelling. This suggests that the name is either from a now 'lost' medieval site, and about 8% of all British Isles surnames do originate from such places, or it is a variant form of some place such as Hackwood, found near Hexham, in Northumberland, or Hackwood, near Basingstoke in Hampshire. Unfortunately neither of these suggestions quite fit the bill as the surname is first recorded in Devonshire! This first recording is that of Peter de Hakeworth in the famous Hundred Rolls, in effect the land owners lists, of 1273, during the reign of King Edward 1st of England, whilst a later recording in Devonshire is that of Christopher Hackwood, of Kingston near Ivybridge, on October 19th 1711. The famous Victorian etymologist Canon Charles Bardsley suggested that Hackworth was a variant form of Ackworth, and whilst this is possible he does not provide any examples. What is certain is that a patronymic form of the as Hackworthie, and later Hackworthy, is well recorded in Devon from at least the mid 16th century, when Johan Hachworthie was a witness at Coffinswell on January 21st 1560, and therefore on balance the surname does seem to be from the West Country. Although the surname does not seem to be recorded in Northumberland in any spelling until 1663, when Ann Hackworth married John Pattison at Newcastle upon Tyne, on October 21st of that year, from there on it appeared regularly, if never often enough to be popular in the recording sense. Amongst the later recordings is that of the famous Timothy Hackworth, friend and associate of George Stevenson, born at Ovingham, Northumberland, on January 26th 1787.